UPDATE – 12-October-2013: I have moved the code for this project to GitHub. This mockup shows only 6 hours. The UI needs to scroll in order to show the full 24-hour day. 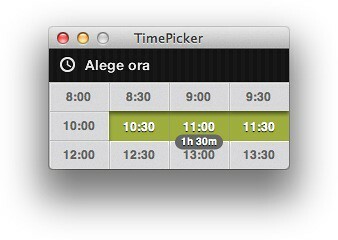 I chose only to implement click and drag to select time ranges. I imagine that shift-clicking might be desirable. I didn’t attempt to handle keyboard input. At first I though the 1/2 hour grid was self evident. However, when I began using the UI, I decided I needed duration feedback while dragging to know exactly how long the selected period is. Time can only be selected in 1/2 hour increments. Time can only be selected within a single 24-hour day. Auto-scrolling while dragging is problematic. It may be that auto-scrolling needs to slow down, or more rows need to be made visible in the scroll view. The project requires Xcode 4.2, and the Mac OS X 10.7 SDK.